With the global rise of 24-hour living and the demise of the traditional nine-to-five, we look at how retailers have begun to consider ways in which they can cater for a 24/7 economy. Using the latest interactive technology, forward-thinking stores have begun to develop engaging innovations in-store, as well as shoppable window displays helping to extend a physical store’s life and allowing consumers to purchase products when the store is closed or without entering. Dubbed the ‘customer remote’, Swedish hardware/homeware retailer Clas Ohlson’s new digital window enables consumers to browse through the brand’s catalogue around the clock. Activating the display by scanning a QR code, browsing can be controlled by flicking one’s phone left or right and purchases can be made on the spot. Similarly, Intersport’s Beijing store boasts a giant 24/7 window display. Using motion-sensory technology and facial-recognition tools, the sizeable screen can even distinguish the age and gender of passers-by, subsequently recommending the most appropriate products to them. Not only does interactive technology enable ‘vampire vending’ via out-of-hours window displays, but the same tools can also be utilised to further promote products and brands in store. 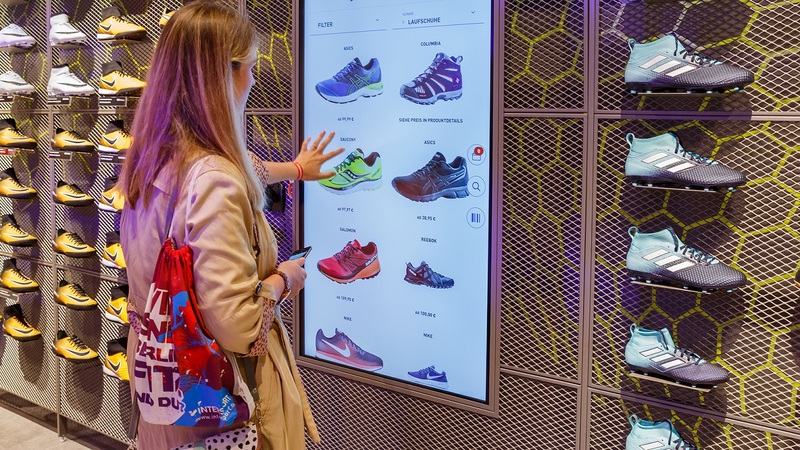 Picking up the interactive pace, Intersport’s ‘cloud shelf’ allows customers to browse and purchase all products (even those out of stock), while their ‘smart shoe shelf’ instantly shares product information onscreen as shoppers take shoes (equipped with a motion sensor and unique ID) from the shelf. Furthermore, Clas Ohlson’s welcome screen offers in-store service information, while their large-scale wall screen demonstrates specific product features and unlocks reviews via a barcode scanner. At any time, customers can scan the on-screen QR code with their phones and transfer browsing back to their own devices to continue research out-of-store. Facial-recognition tools used to distinguish window shoppers have also been adopted by brands like Nutella, using face-mapping technology to personalise displays according to whether a consumer appears happy, grumpy or inspired. “Digitalisation makes it possible to decipher emotions in milliseconds,” says Andrea Gröppel-Klein, Director of the Institute for Consumer and Behaviour Research at Saarland University in Germany. In a light hearted example, China’s Alibaba store awards discounts to smiling customers, as measured by the ‘Happy Go’ happiness meter (aka a face-recognition tool). Evidently, interactive technology is not only essential for 24/7 window displays – which in turn is crucial for a 24/7 economy – but also for connecting online and offline experiences in store. Both fun and convenient, we believe that these kinds of initiatives are no doubt shaping the future of retail and will soon be a requirement for all brands if they wish to stay relevant and on-trend. Get in touch if you would like to discuss how your brands can be at the forefront of retail activations.